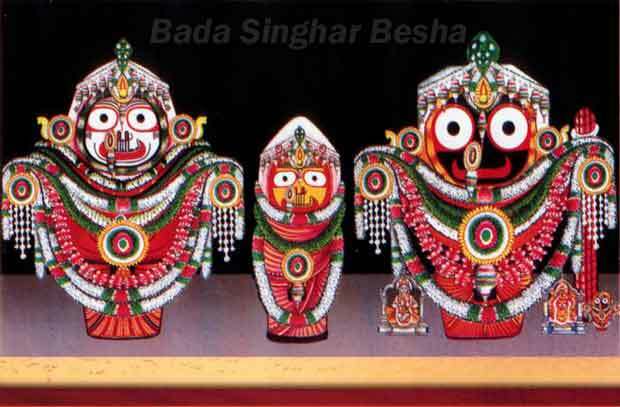 Have you seen all beshas of Lord Jagannath, Lord Balabhadra and Devi Subhadra? Everyday the deities of Shree Jagannath Temple, Puri are adorned with cotton and silken fabrics, gold ornaments studded with precious stones, flowers of several kinds, other leaves and sandal paste. It is stated that, the images change their clothes and wear different kinds of ornaments as many as eight times during a normal day. On special occasions the deities are dressed and decorated in suitable manner. There are particular persons belonging to the temple services who know the traditional ways of dress and decoration. 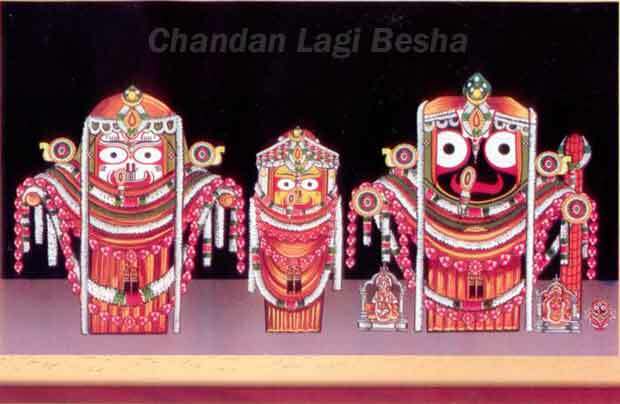 Know about different Besha of Lord Jagannath here. Abakasha Besha or Tadapa Uttari Besha – This Besha is done everyday immediately after Mangala Alati. The clothes, which are worn by the deities for this purpose are known as ‘Tadapa’ and ‘Uttariya’. 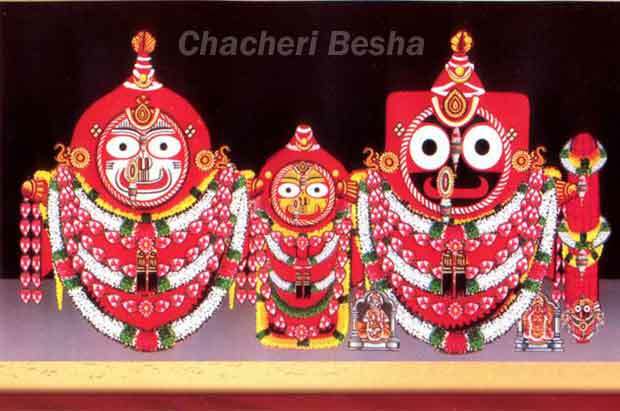 Sadha Besha – Everyday the three deities are dressed with coloured Baralagi Pata (silken cloths) from Sunday to Saturday. The colour represents the colour of the planets. Bada Singhar Besha – The most important decoration of the day is the Bada Singhara Besha. It is done every night before the Ratri Pahuda (last ritual). Chandan Lagi Besha – Sandal wood paste is smeared on the divine body of the deities in the month of Baishakha and Jyeshtha, spreading over 42 days during Chandana Yatra. 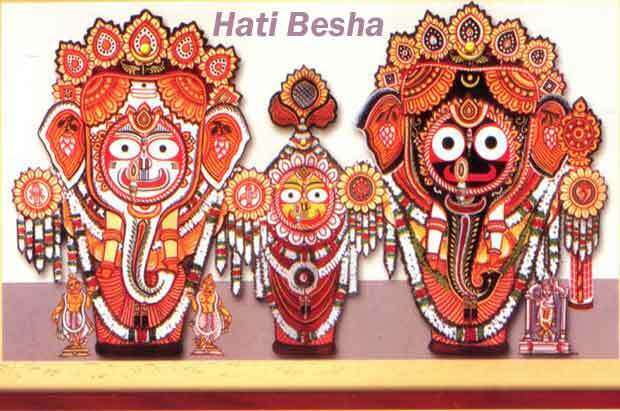 Gajanana Besha or Hati Besha – Ganesh Besha is done on the occasion of Snana Yatra. The annual cycle of festivals of Shree Jagannath Temple begins with the Snana Yatra. Padma Besha – Any Saturday or Wednesday between the new moon day of the month of Magha and Basanta Panchami is chosen for the Padma Besha. 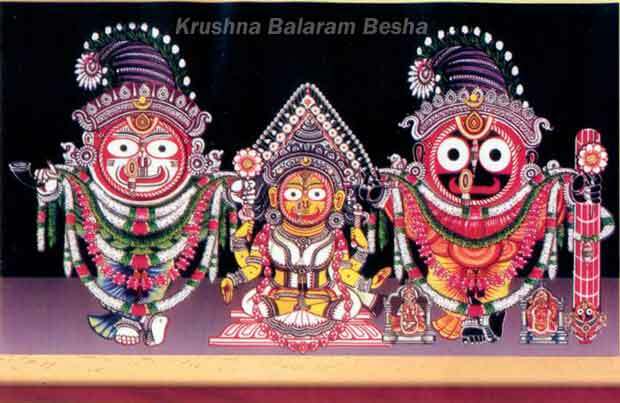 It is made during the ‘Bada Singhara’ ritual at night and the deities remain with the Besha throughout the night. day of the bright fortnight in Asadha) when the deities are in their respective chariots in front of the Lions Gate of Shree Jagannatha Temple on their return journey from Car Festival. This Besha is also known as ‘Bada Tadhau Besha’. Banabhoji Besha – This besha is done on the 10th day of the dark fortnight of Bhadrab. The deities are dressed like cowherd boys, as if they are going to attend a picnic. 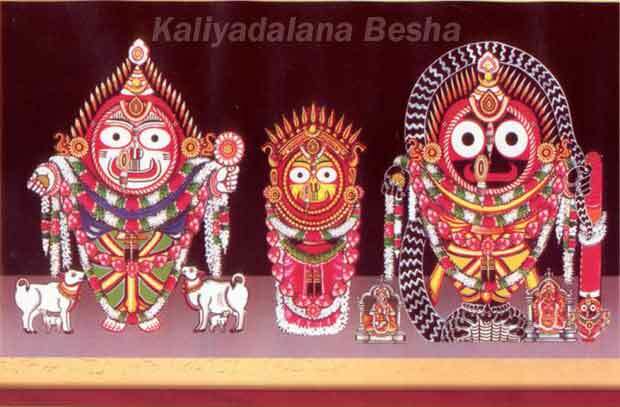 Kaliyadalana Besha – This besha takes place on Bhadraba Krushna Ekadasi Tithi (the 11th day of the dark fortnight in Bhadraba). Lord Shree Jagannath is dressed like Krushna killing the Kaliya serpent. 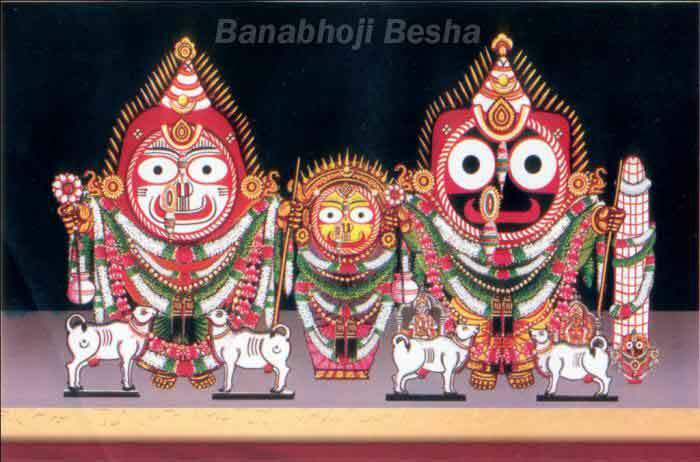 Pralambasura Badha Besha – It is done on Bhadraba Krushna Dwadasi Tithi (the 12th day of the dark fortnight in Bhadraba). A demon, Pralamba by name, was killed by Balaram, the elder brother of Krushna. 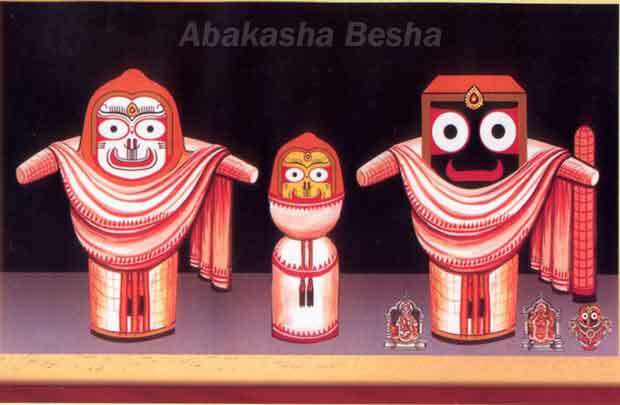 So Balabhadra wears this Besha in the month of Bhadraba. Krushna Balaram Besha – This besha is done on Bhadraba Krushna Trayodasi Tithi (the 13th day of the dark fortnight in Bhadraba). 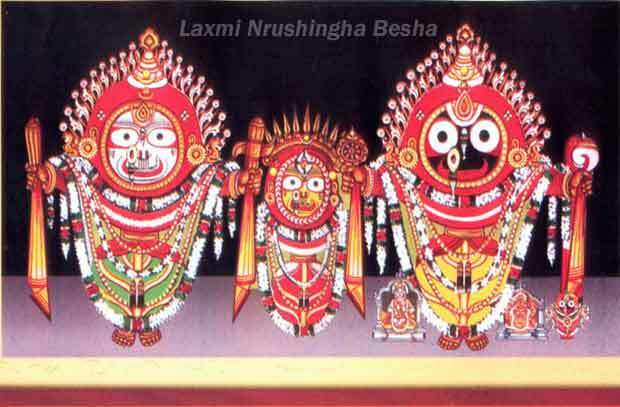 In this Besha Shree Jagannatha & Shree Balabhadra are dressed like Lord Krushna & Lord Balaram. 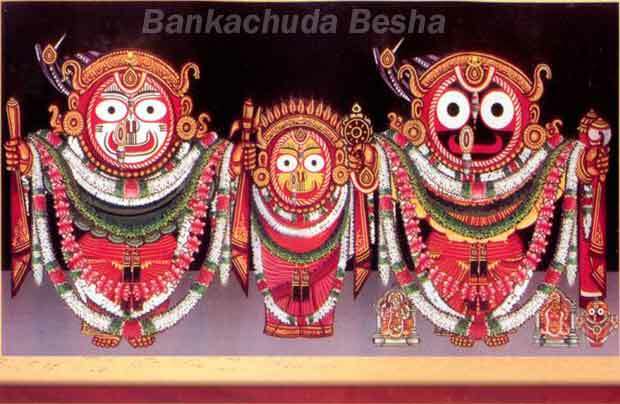 Bamana Besha – On Bhadraba Sukla Dwadasi Tithi (the 12th day of the bright fortnight in Bhadraba), Shri Jagannatha is dressed as like Bamana the incarnation of Bishnu. Notably, Baman is the fifth incarnation of Lord Bishnu. Raja Besha – This besha takes place on Vijaya Dashami Tithi (Dasahara) in the month of Aswina. Jagannatha was regarded as the King of Odisha since the rule of Ganga dynasty and this Besha of Shree Jagannatha continues from those days. held every year from the 11th day of bright fortnight of Aswina to the 10th day of bright fortnight of Kartika. Harihara Besha – During the time span of the Radha-Damodar Besha of Shree Jagannatha on each Monday, Harihara Besha of Lord Shree Balabhadra is done for a fortnight, i.e. from the darkmoon day till the fullmoon day. 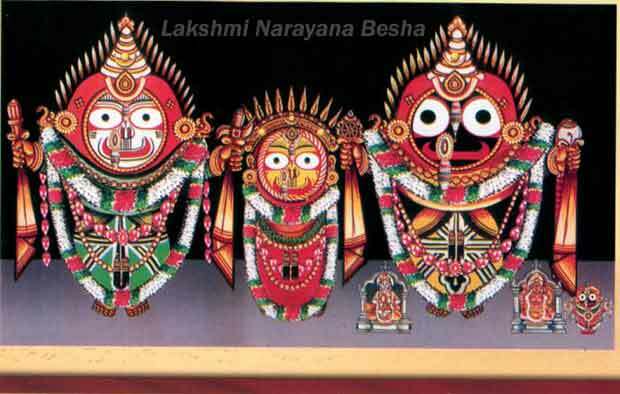 Lakshmi Narayana Besha – This besha is also known as ‘Thiakia Besha’. It is done on the 11th day of the bright fortnight of Kartika. It is stated that the worship of Lakshmi and Narayana has gained popularity in Jagannatha consciousness, since the visit of Ramanuja, the great religious preacher to this holy land of Shreekshetra Puri. Bankachuda Besha – It is done on Karttika Sukla Dwadasi Tithi (the 12th day of the bright fortnight in Karttika). This is similar to that of Lakshmi-Narayan Besha with addition of golden headgear. Adakia Besha – This Besha is also known as ‘Tribikram Besha’. It is done on Karttika Sukla Trayodasi (the 13th day of the bright fortnight in Karttika). Dalikia Besha – This Besha is done on Karttika Sukla Chaturdasi tithi (the 14th day of the bright fortnight of Karttika). This is also known as Laxmi Nrushingha Besha. Nagarjuna Besha – This Besha takes place in such years in which there are six days of ‘Panchaka’ in lieu of 5 in the month of Karttika. On that occasion Shree Jagannath and Shree Balabhadra are dressed like Nagarjuna (a military general) on this extra day. Raja Rajeswar Besha – This Besha takes place on Kartika Purnima Tithi (fullmoon day of Karttika). Large numbers of devotees are allowed to go up to Ratnasinghasan and have a darshan of the above gorgeous Besha of the Lords and be blessed themselves. ‘Ratnasinghasan’. During the period from the 6th day of the bright fortnight of Margasira to the 5th day of the bright fortnight of Magha (Basanta Panchami Tithi), the deities wear winter clothes. Jamalagi Besha – From Basanta Panchami to Dola Purnima (fullmoon day of Chaitra), the Deities wear modified winter dress known as ‘Jamalagi Besha’. 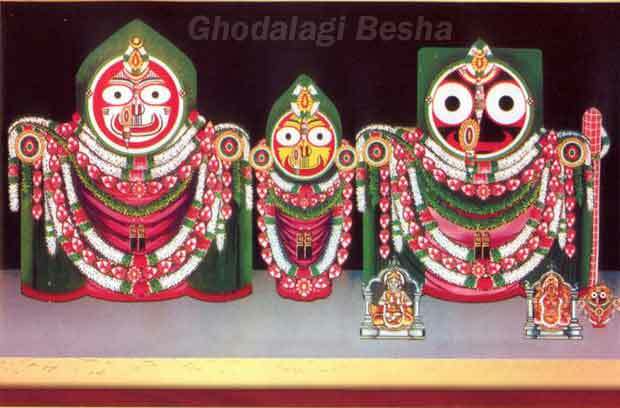 Sraddha Besha – Shree Jagannatha puts on this Besha in the month of Margasira for three days during ‘Deva Dipabali’ occasion. Chacheri Besha – From the 10th day of the bright fortnight of Phalguna to the fullmoon day except the 14th day, this Besha takes place. 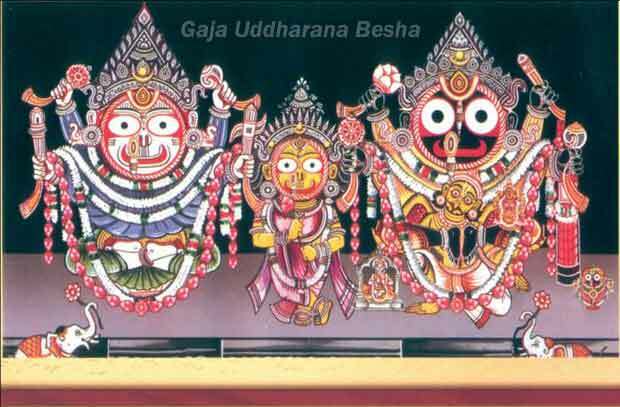 Gaja Uddharana Besha – The famous Gaja Uddharana Besha is done on Magha Purnima tithi (the fullmoon day of Magha). This Besha depicts an epic story as to how Lord Bishnu saved a helpless elephant from the clutches of a crocodile. 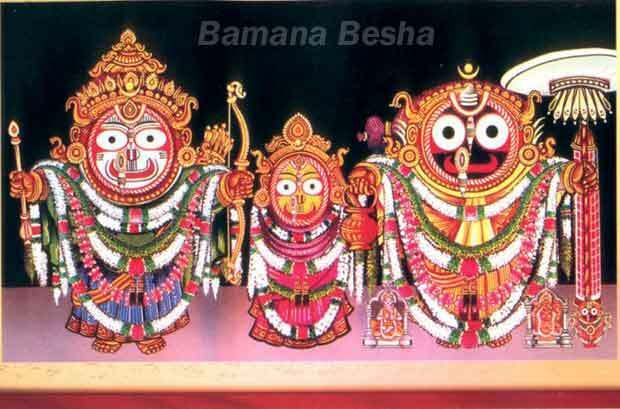 Raghunatha Besha – This Besha is observed in the month of Chaitra (March-April). 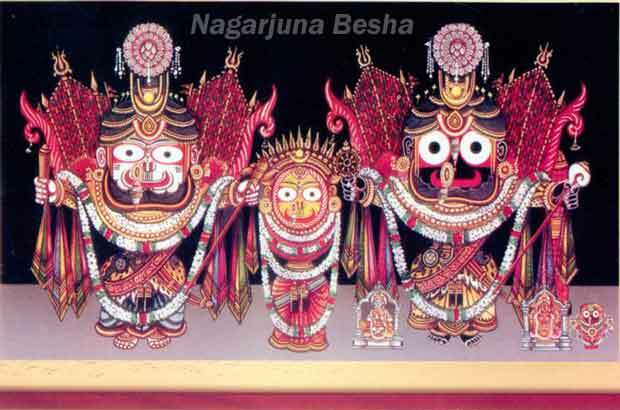 In this Besha, Lord Shree Jagannatha is dressed like Shree Rama and holds a bow and an arrow.